The BMJ (British Medical Journal) Clinical Evidence compiles a database showcasing the best available evidence on common clinical interventions. The BMJ team reviewed the level of recommendation for 3,000 treatments across general medicine for which randomized controlled trials were available and rated each treatment according to benefit versus risk. http://clinicalevidence.bmj.com/x/set/static/cms/efficacy-categorisations.html (Accessed March 17, 2018. Their results are summarized in the bar graph. The total for all bars adds up to 100% . 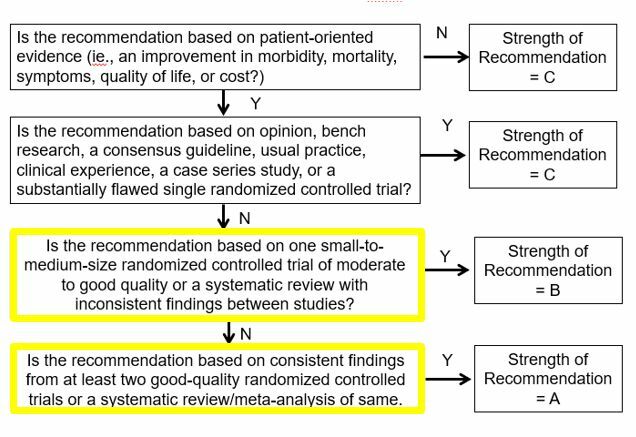 Through use of randomized controlled trial evidence only 11% of treatments reviewed across general medicine have a strong (equivalent to SOR A) level of recommendation and 24% have a favorable, although not strong (equivalent to SOR B), level of recommendation. Although this does not indicate choices of treatment individual practices, it implies that nearly 2/3 of common clinical interventions in everyday practice do not have moderate or good evidence basis. 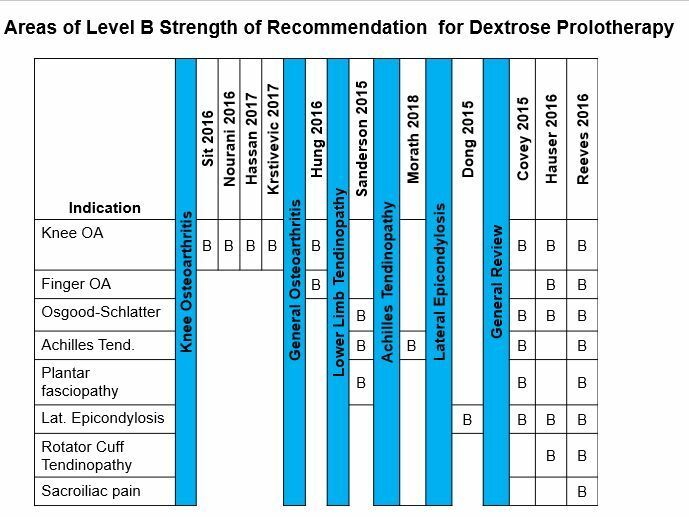 How Does Dextrose Prolotherapy Evidence Compare? Despite the need to almost completely self-fund clinical trials, and donate all treatment time, because of lack of proprietary (drug company or manufacturer) interest in research, here is what the evidence looks like at this point in time (updated to 2018) for dextrose prolotherapy. Level B = Likely to be beneficial (see above bar graph). On the left are the areas with level B evidence and along the top ar the names of author who have all published metaanalyses summarizing the body of research in each area, and the year of that publication, 2015-2018.
sHow is a Strength of Recommendation Determined? The two primary systems for overall evidence evaluation are Strength of Recommendation Taxonomy (SORT) and Grading of Recommendations Assessment, Development and Evaluation (GRADE). The “Strength of Recommendation Taxonomy (SORT) system is simpler, more user-friendly, and was developed by a collaboration among family medicine editors. The process of coming to a rating conclusion on a strength of recommendation (SOR) using SORT taxonomy is described in this flow chart. Simply speaking, ie one favorable small to medium size randomized controlled trial (RCT) has been published, or if a metaanlysis showed favorable but inconsistent findings between studies the level of evidence is A. One can easily see that unless multiple studies are available of moderate or larger size that agree closely with each other, level A evidence if not present, and thus only a few treatments used in medicine today have level A evidence. In this research section the emphasis on randomized controlled trials only, since that is the strongest type of clinical data available, with exception of metaanalyses in which the results from two or more randomized controlled trials ae combined or reviewed. Why are so many treatments in general medicine done with not much evidence of benefit and why is dextrose prolotherapy not covered by insurance? It is important to keep in mind that treatments that are commonly done are considered "customary or usual practice" and typically they do not undergo scrutiny as to their effectiveness. The second question is more complex but when treatment is considered for coverage by an insurer, unless it is so common that the insurer has to consider it customary or usual, the insurer will not cover it unless there is level A evidence, which sets the bar quite high, and, yes, higher than most treatments given today. That is why researchers in prolotherapy don't expect insurance coverage anytime soon. Instead, they focus on slowly building the body of evidence through the dedication of individual young researchers willing to sacrifice their their time and money, meanwhile expecting that more and more doctors and patients will become so frustrated with the treatments that are covered by insurance, that virtually all new physicians will be learning prolotherapy, forcing insurers to cover it. Is there evidence that dextrose prolotherapy is entering "academia"? (Being taught at academic institutions): Yes. • Harvard Department of Physical Medicine and Rehabilitation, Massachusetts General Hospital and Spaulding Rehabilitation Hospital Integrated Sports Medicine Fellowship. • National Capital Consortium (NCC) Physical Medicine & Rehabilitation Residency Training Program at Walter Reed Medical Center. • University of Wisconsin Department of Family Medicine and Community Health. In addition, training in prolotherapy is part of the basic standards for residency training in integrated osteopathic family practice/neuromusculoskeletal medicine, affecting 37 individual resident programs.